(Sept. 2, 2009) - The top-selling Bible in North America will undergo its first revision in 25 years, modernizing the language in some sections and promising to reopen a contentious debate about changing gender terms in the sacred text. The New International Version, the Bible of choice for conservative evangelicals, will be revised to reflect changes in English usage and advances in Biblical scholarship, it was announced Tuesday. The revision is scheduled to be completed late next year and published in 2011. "We want to reach English speakers across the globe with a Bible that is accurate, accessible and that speaks to its readers in a language they can understand," said Keith Danby, global president and CEO of Biblica, a Colorado Springs, Colo.-based Christian ministry that holds the NIV copyright. But past attempts to remake the NIV for contemporary audiences in different editions have been plagued by controversies about gender language that have pitted theological conservatives against each other. The changes did not make all men "people" or remove male references to God, but instead involved dropping gender-specific terms when translators judged that the original text didn't intend it. So in some verses, references to "sons of God" became "children of God," for example. Supporters say gender-inclusive changes are more accurate and make the Bible more accessible, but critics contend they twist meaning or smack of political correctness. Acknowledging past missteps, the NIV's overseers are promising that this time, the revision process will be more transparent and that they will actively promote what they describe as a long-held practice of inviting input from scholars and readers. 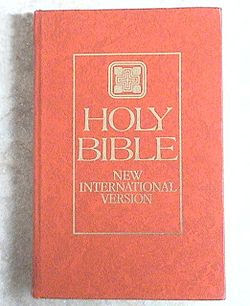 The NIV was first published in 1978 and more than 300 million NIV Bibles are in print worldwide; its publishers and distributors say the translation accounts for 30 percent of Bibles sold in North America. The Committee on Bible Translation, an independent group of conservative scholars and translators formed in 1965 to create and revise the NIV, will oversee the new revision. An effort earlier this decade to create a separate version of the NIV that used more gender-inclusive language in an attempt to reach a younger audience fell flat with groups that felt it crossed the line. That edition, Today's New International Version, will cease publication once the new-look NIV is released, said Moe Girkins, president of Grand Rapids, Mich.-based Zondervan, its North American publisher. "Whatever its strengths, the TNIV has become an emblem of division in the evangelical Christian world," Girkins said. It was the TNIV that ushered in changes from "sons of God" to "children of God," or "brothers" to "brothers and sisters." In Genesis I, God created "human beings" in his own image instead of "man." Many prominent pastors and scholars endorsed the changes. But critics said masculine terms in the original should not be tampered with. Some warned that changing singular gender references to plural ones alters what the Bible says about God's relationships with individuals. The Southern Baptist Convention passed a resolution saying the edition "has gone beyond acceptable translation standards." "We fell short of the trust that has been placed in us," said Danby, of Biblica. "We failed to make a clear case for the revisions." Danby said that freezing the NIV in its 1984 state was also a mistake, however. He emphasized that in the revision, about 90 percent of the NIV will be unchanged. Douglas Moo, a professor at Wheaton College and chairman of the Committee on Bible Translation, said the group is committed to "a complete review of every gender related change." "I am not sure how it's going to come out," Moo said. "We have a genuine, authentic review process ... Everything is on the table." One of the most vocal critics of gender-inclusive translations, Randy Stinson of the Louisville, Ky.-based Council on Biblical Manhood and Womanhood, said the group supports updating the NIV. He credited organizers for their openness. "We're still probably going to differ on the way they handle some of the gender language," Stinson said. "But we're open and anxious to see what they come up with and we're really going to be reserving judgment." Most changes will have nothing to do with gender inclusivity, Moo said. And the TNIV provides a glimpse of likely changes: In the '84 NIV, Mary is "with child," but in the TNIV she is "pregnant." In the NIV version of Psalm 146:9, "The Lord watches over the alien." The TNIV used "foreigner" instead of "alien."